Learn how to transmit information from Procare to Listen360 for use with the Listen360 customer feedback system. You must have an account with Listen360 for your center. Visit Listen360.com for details. You’ll transmit info from Procare as often as you like to keep Listen360 up to date with your latest enrollment and withdraw information. This lets you get feedback from families as to how likely they are to recommend your center and feedback on how your center is doing. Listen360 checks for any newly transmitted information at 5:00 p.m. Eastern Time each day. Only families with children enrolled for more than 21 days are brought into Listen360. Families with children enrolled less than 21 days or who have a different enrollment status, like withdrawn, wait list, preregistered, etc., are ignored by Listen360. Listen360 automatically places the families in different segments so only a small percentage are asked for feedback at a time. What information is sent to Listen360? The name of your center (known as the School Name) along with the abbreviation (School Code), like S1, S2, etc. and the Region in which the center is located, which is useful when you manage multiple locations and/or regions. The contact information of the parents/guardians (anyone listed as a Payer in Procare), including their name, email, phone numbers, and street address. The child information, including their name, gender, birthday, classroom (their Primary Classroom in Procare), most recent enrollment status and the status date. You may transmit information for all locations at once or a single location. If you have more than one location—and only wish to transmit information for a particular location (instead of all locations)—use the Change School button at the Procare Home screen to select the location you want to transmit first to Listen360. From the Procare Home screen go to Utilities > Procare Extras > Listen360. 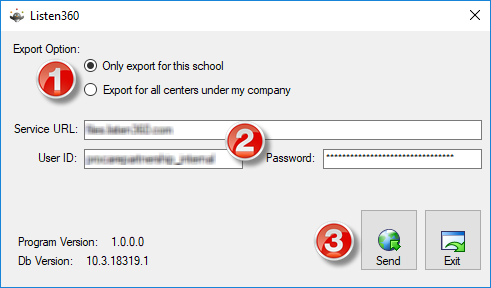 Choose whether to export only for the school you are currently logged into in Procare or export for all schools (all centers). The first time you use this tool, you’ll need to enter your Service URL (provided by Listen360) and your User ID and Password to log into Listen360. This information is saved once you Send or Exit. Now you are ready to transmit the information to Listen360. Click Send. 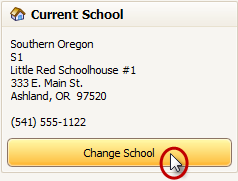 At the Procare Home screen, use Change Schools to select the next school you want to transmit. 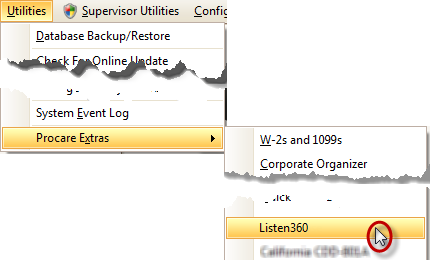 Open the Listen360 extra again (Utilities > Procare Extras > Listen360). Repeat the steps above and choose Send. Follow your instructions from Listen360 for details on how to use the Listen360 service to send inquiries to families and manage customer feedback. For help with Procare’s Listen360 “extra”, contact Procare Support. For assistance with Listen360 itself, please contact Listen360.